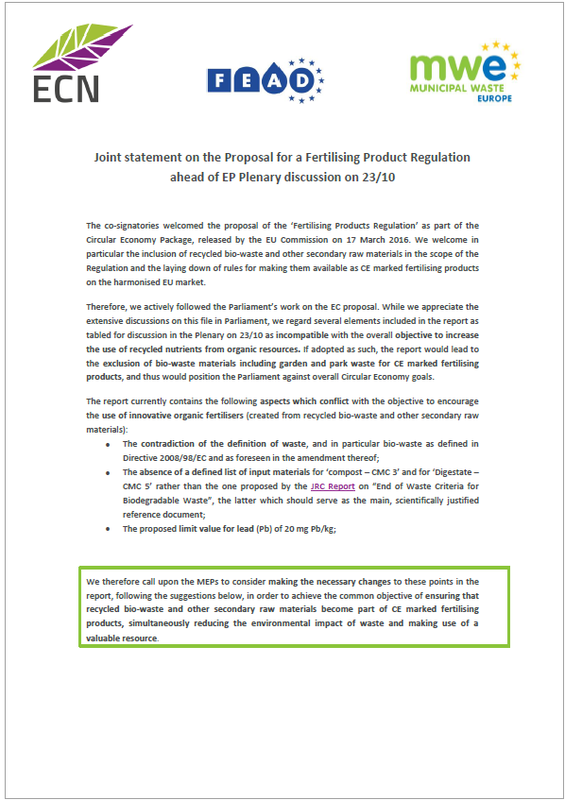 Ahead of the European Parliaments Plenary’s 23 October discussion on the CE marked fertilising products proposal, the Parliament has tabled further amendments on the fertilisers file. Several amendments of the Parliament are still incompatible with the overall objective to increase the use of recycled nutrients. The proposed limit value for lead (Pb) of 20 mg Pb/kg. 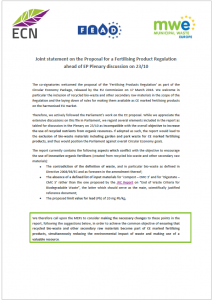 The signatories therefore call upon the MEPs to consider making the necessary changes to these aspects in the report, in order to fulfil the shared objective of ensuring recycled bio-waste and other secondary raw materials will be part of CE fertilising products. Technical proposal on End-of-Waste criteria for Compost and Digestate should be respected. With regard, to the Commission’s proposal, some aspects, like setting up specified input lists for the component material categories and adequate time-temperature requirements for producing compost and digestate, have to be reconsidered. The European Compost Network stresses again that harmonised and reliable criteria for compost and digestate, which will be placed as organic fertilisers and soil improvers on the European market should be set. These should be based on the technical proposal on end-of-waste criteria for compost and digestate, worked out by the Joint Research Institute ‘IPTS’ of the European Commission. For following the discussion in the Council and with regard to the expected inter-institutional negotiations the European Compost Network has therefore published an updated position paper. 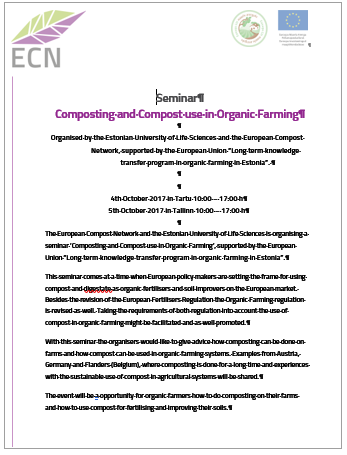 The European Compost Network and the Estonian University of Life Sciences is organising a seminar ‘Composting and Compost use in Organic Farming’, supported by the European Union “Long term knowledge transfer program in organic farming on 4-5 October 2017 in Estonia”. This seminar comes at a time when European policy makers are setting the frame for using compost and digestate as organic fertilisers and soil improvers on the European market. Besides the revision of the European Fertilisers Regulation, the Organic Farming Regulation is revised as well. Taking the requirements of both regulation into account the use of compost in organic farming might be facilitated and as well promoted. 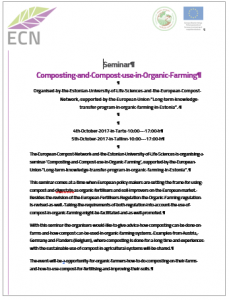 With this seminar the organisers would like to give advice how composting can be done on farms and how compost can be used in organic farming systems. Examples from Austria, Germany and Flanders (Belgium), where composting is done for a long time and experiences with the sustainable use of compost in agricultural systems will be shared. The event will be an opportunity for organic farmers how to do composting on their farms and how to use compost for fertilising and improving their soils. ECN has redesigned the English version of the Summary Report of a scientific study conducted from 1995 to 2008 examining the influence of compost application in long-term field trials. The project was managed by the Center for Agricultural Technology Augustenberg (LTZ) of the Ministry for Food and Rural Areas (Ministeriums für Ernährung und Ländlichen Raum Baden-Württemberg) Germany in cooperation with Helmholtz Centre for Environmental Research - UFZ, Department of Soil Ecology, Halle; Bioplan Dr. Reinhold and Dr. Müller GmbH, Klein Machnow. The project was supported by Ministry for Food and Rural Areas (Ministerium für Ernährung und Ländlichen Raum) Baden-Württemberg and German Compost and Humus Organisations: Bundesgütegemeinschaft Kompost e.V., Köln, Gütegemeinschaften Kompost Region Süd und Region Südost, Verband der Humus- und Erdenwirtschaft (VHE) und Verband der Humus- und Erdenwirtschaft Nord. In several lectures (in German language), the future of sewage sludge utilization in Austria and Europe will be discussed and the Federal Waste Management Plan 2017 and current discussions at EU level will be examined in this context. 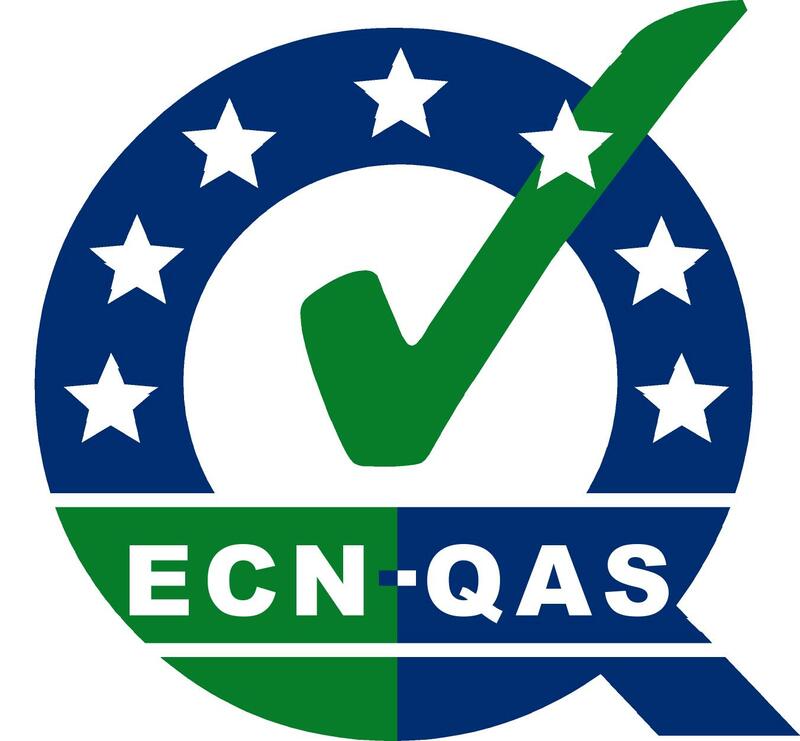 ECN will present the latest developments in the policy debate on the Waste and Fertilser Proposals. Information on the newly established Compost and Biogas Association Austria (KBVÖ) and the activities of the ÖWAV as well as an excursion to the extended facility of Huemer Kompost GmbH round off the ERFA compost 2017.